Test Irrigation Systems: As spring rains taper off, you want to be sure your sprinklers or drip systems are functioning well to keep your plants properly watered. Test the system thoroughly, including any timers or auto-sensing functions, and make any repairs or upgrades as needed. 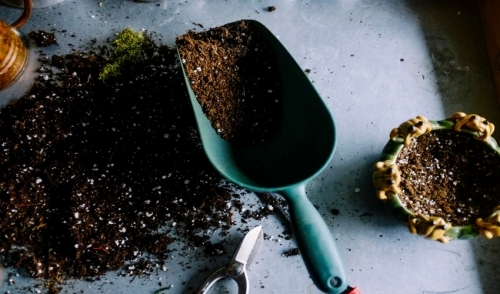 Tend Compost Piles: Spring moisture is helpful to keep compost healthy and active, and you can help it even further by aerating the pile and mixing some of that moisture into the center. If you have compost ready for your garden, now is the time to spread it and work it into the soil. Weed Aggressively: Weeds are easiest to pull when they are small and the soil is still damp, making hand weeding a perfect May garden task. The more weeds you pull now, the fewer there will be to propagate later, and the fewer chemicals you will need to control them. Mulch Properly: Before topsoil dries out as spring wanes and summer begins, refresh your mulch on pathways, around trees, in flowerbeds, and throughout your garden. This will minimize weed growth and help conserve water as the season warms up. Prune and Divide Spring Bloomers: If you have spring perennials that have lost their blooms by May, it is time to gently prune them and divide mature plants if desired. Deadheading bulbs will also tidy up the spring beds, but leave foliage intact to nourish next year's bulb growth. Plant Containers: As nighttime temperatures become more moderate, container plantings can thrive and May is a great time to plant pots of herbs, flowers, and grasses to decorate your porch, deck, stairs, pathways, railings, or window boxes. Attract Migrating Birds: May is a peak month for migrating birds to return, and gardeners who attract their feathered friends will also be attracting natural pest control. Add a bird feeder or a bird bath to your garden and you'll be amazed at what birds will visit. Care for Your Lawn: Late spring is the perfect time to be sure your lawn is in its best condition for the rigors of summer use, and May is a good time for lawn aeration, reseeding, weed control and other care that will keep the turf strong and healthy. Visit Community Gardens: Many community gardens may have festivals in May, and avid gardeners will visit not only to enjoy the displays, but to get inspiration for their own gardens. Take along a camera or notebook to record what you like best, and watch for plant sales and gardening classes or workshops to expand your skills. Tend Houseplants: Don't forget your indoor gardens in May. As daylight increases, houseplants' needs will change, and now is the time to alter feeding and watering schedules, check plant health, and repot houseplants if necessary. May is a busy month for gardeners, and no matter what type of gardening you prefer, there's always a task to tend to during this beautiful spring month.